Our Ambulance Care Assistant (VTQ) qualification is designed to meet the core requirements of trusts, independent ambulance services and voluntary aid societies for learners who intend to work in the patient transport and emergency care industry. 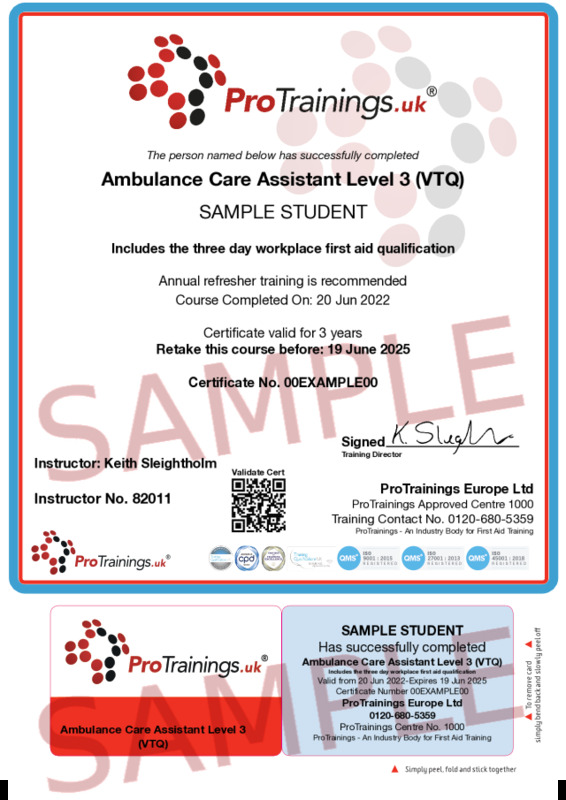 This Ambulance Care Assistant (VTQ) course falls under a ‘Vocational Training Qualification’ framework for delivery and assessment and is designed to assist learners with the knowledge, understanding and skills to drive a range of patient care ambulance vehicles safely and under the control of qualified drivers. This training will include content that is designed to assist with emergency care before and while transporting patients from their homes to hospitals, care centres, outpatient clinics, events and large public places. Ambulance Care Assistant (VTQ) is focused on improving emergency medical care, punctuality performance and service quality. Ambulance Care Assistants working with patient groups will receive ideal training to ensure they have the skills to be able to provide the additional specialist care needed. This course comes with 40.0 hours of CPD, although the time to complete the course online may be less than this.